Most of the trains running in gardens today are models of some real-world train somewhere. 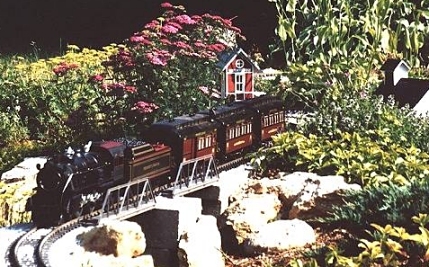 To many garden railroaders (especially those who "graduated" from indoor trains), part of the fun of garden railroading is choosing a real railroad for inspiration, then choosing equipment and other options that would be at home on the real railroad. Location: - North America, Europe or other? Okay that doesn't sound quite fair to my friend in "other" parts of the world, but most of them are modeling North American trains, so what can I say? A mainline "common carrier"* like USA's Pennsylvania or Great Britain's Great Western had many kinds of trains, including express freight and passenger as well as local freight and passenger. A shortline common carrier usually maintained both freight and passenger service, but served a relatively small region. An industrial railroad was usually owned by a company that was in some other business, such as logging or mining. A few large industrial railroads also took paying passengers, but they were not technically "common carriers," since they hauled their own employees and stuff around for free. A traction railroad usually ran in urban areas under electrical power, although some other forms of power were tried. In some large cities, "trolleys" carried not only people, but also freight. Track Width: Standard Gauge or Narrow Gauge - Most of the big mainline railroads set their rails 4' 8 1/2" apart, which became known as "standard gauge." Many smaller railroads and most industrial railroads set their rails at closer distances - hence the term "narrow gauge." 36" was popular in North America and Europe. Metre gauge was also popular in Europe. 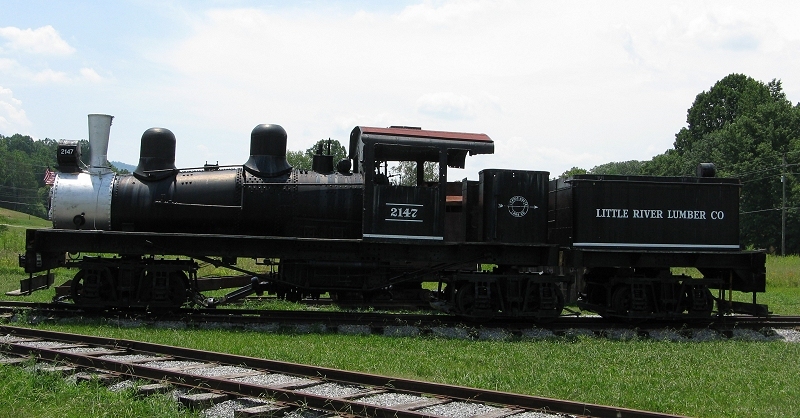 Other gauges included 40", 30", and 24", and many industrial railroads had one-off gauges such as 32" or 33". Narrow gauge railroads were cheaper and easier to squeeze into hard-to-reach places, so this choice was especially attractive to industrial railroads and to short lines operating on a "shoestring." Most mainline common carriers in the United States were standard gauge (today all of them are). For many decades, the Denver and Rio Grand Western broke that rule - they provided all of the services of a mainline common carrier, while running on 36" track. Today, however, the remaining commercial D&RGW trackage is part of the Union Pacific and has been converted to standard gauge. If you like standard gauge, you're in luck - a wide range of standard gauge models of trains from 1900 to 2008 are available from AristoCraft, MTH, and USA Trains. If you want to model mainline narrow gauge, you're in luck, too - some pretty big D&RGW locomotives are coming onto the market. Before 1930, a good proportion of the short lines in North America were narrow gauge (mostly 36"), although a few were standard gauge. Today, the few remaining commercial short lines are all standard gauge. If you like short lines, you have your choices of old-timey narrow gauge from Bachmann, or more modern standard gauge from AristoCraft and other vendors. Most industrial railroads were narrow gauge. 36" was the most common, but smaller gauges were popular, including 30" and 24", a popular gauge for pulp mills and sugar plantations. The Bachmann Shay is an example of a popular trend to use bigger (1:20.3) models of smaller, industrial trains. Traction was both standard gauge and narrow gauge, with standard gauge more popular in large cities. Many narrow gauge traction models are available in 1:22.5 (Bachmann) and 1:24 (Hartland Locomotive Works). Once you've decided on a kind of railroading you want to model, you may look for individual railroads for inspiration. Some other railroads, though, aren't as well represented on the store shelves as others. Nickel Plate, for instance. You could buy equipment from other lines and repaint them for your favorite, of course, but a USRA-style Mikado, as beautiful as it may be, is not a Nickel-Plate Berkshire. So if you have your heart set on a particular railroad, you may have to decide what level of compromise you are comfortable with. Finally, even if you settle on a particular railroad, you can choose whether to attempt to replicate it in every possible detail or simply use it as inspiration to guide your overall direction (and specifics where reasonably possible). For my railroad, I try to use Pennsy-style equipment when possible, but it's not always possible (or affordable). Most of my locomotives, cabeese, and passenger cars are labeled for Pennsy, too, so you might think I'm modeling Pennsy. But I can't, really - not enough equipment is really available. To adjust for the "compromise," I use the fiction that the New Boston and Donnels Creek is a shortline attached to the Pennsylvania's Western Division (which did have a reputation for running a hodgepodge of stuff compared to the Eastern Division). Two of my friends, Denny Lamusga and Wil Davis, like Great Northern. They both use models of Great Northern when available. 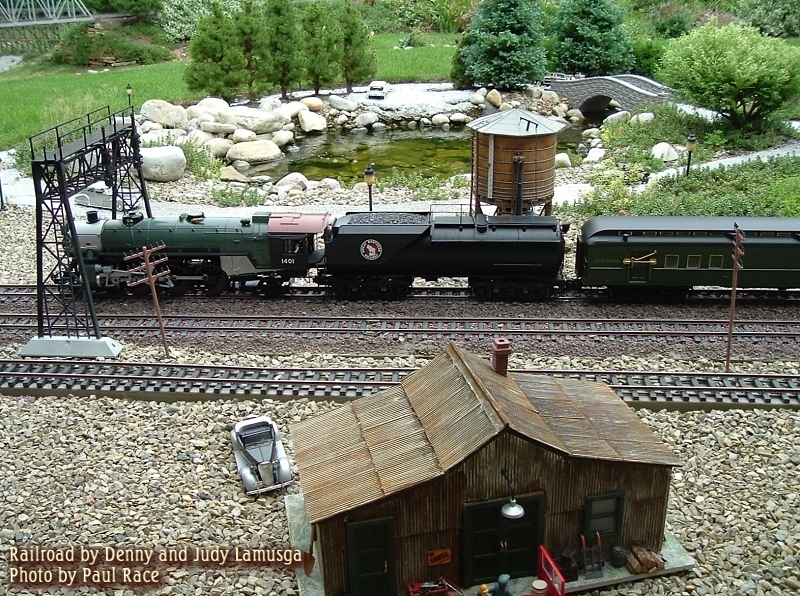 But neither Denny's "Garden Northern" railroad or Wil's "Buckeye Falls" railroad runs exclusively Great Northern models. Issues of compromise aside, many garden railroaders (and almost all indoor model railroaders) will tell you that looking to specific real-world railroads for inspiration makes your projects more fun and believable. Most mainline railroads have been well-documented in print over the years. As an example, I have more Pennsy-related books in my collection that I can ever do justice to. Many kinds of resources have also been offered for narrow gauge modelers, although not quite as many. I'll try to provide examples of both at the end of this article. In addition, when I stumble across a kind of railroad that hasn't been documented to death, I'll try providing information here. Here are a few articles about railroads that you might not read about anywhere else. Thirty-Inch Railroading - A fascinating overview of trains that "did more with less," running on 30-inch rails. Some 30" railroads provided all the functions of full-service common carriers on hastily-laid trackage that went boldly where no one else has gone before or since. If you model On30, or just want to get some ideas for unique narrow gauge railroading options, click here. 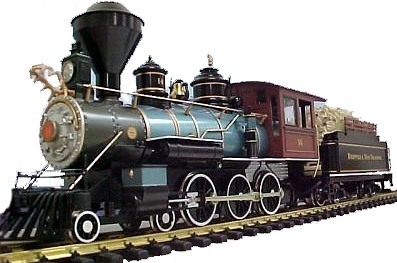 Note: this article is on our "sister site", BIG Indoor Trains(tm). If you visit, a navigation bar on the bottom of that page will help you get back to the Family Garden Trains(tm) primer pages. Small but Mighty - 30" Power - This article reviews the "real-world" steam locomotives that pulled 30" trains in North America (and elsewhere, to some extent). Baldwin, Shay, and other manufacturers made some amazing developments in their efforts to maximize power on minimum rail gauge and weight. The article also gives real-world examples (when possible) of the engines that are available as detailed models in On30 scale and suggestions for modeling 30" railroads in Large Scale as well. 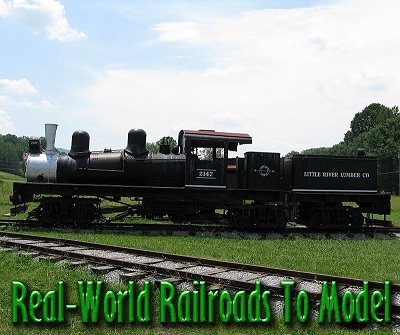 The Little River Railroad - A standard-gauge logging railroad with common carrier aspirations. Here's the best little railroad you never heard of. Between 1903 and 1939, the Little River Railroad and Little River Lumber Company ran 150 miles of track through rugged wilderness, bringing great logs out to support our nation's building booms, but also bringing many people into the Smokey Mountains for the first time and leading to the development of the national park that is there today. The owners' apparent desire to operate like a "big" railroad often collided brutally with business realities, forcing some odd compromises that hardly anyone would believe today if it wasn't for the photographs. Planes, Trains, and Double-Deckers - A detailed, two-part account of our recent experiences with modern rail service in the greater Dublin area, including many photos of old stations, water towers, switch towers, and turntables that are still standing - an unintended tribute to the "golden age of railroading" in Ireland up to 150 years ago. Of course, we also recorded our experiences on modern electric commuter trains, busses, and London's Underground. But it's not hard to see how, say, a century ago, Ireland's rail service - even her stations and locomotives, would have made a nice model for the Isle of Sodor, and would still provide a wealth of modeling possibilities today. Maria Cudequest found some great information about how a railroad yard works from the archives of Croton NY. 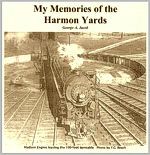 It's a first-person account of a fellow working in and around the roundhouse in New York Central's Harmon, New York yard during World War II. If you feel like your locomotive servicing area could use more detail and "personality," click on the picture to the right to see scans of the article. *A common carrier was a railroad that was in the railroad business and not just in the business of supporting another industry, as Carnegie's coal trains used to support his steel mills. Once such monopolies were broken up in the U.S., a "common carrier" was supposed to make all of the railroad's services, passenger or freight, available to all customers at the same rate - if you owned a railroad and a coal mine, you were supposed to charge your coal trains the same prices as everyone else's. Click the back button to return. Hundreds of books about railroads have been published over the last century. If you get to train shows you may find some that are out of print and still very useful for ideas or authenticity. The examples included below were available at Amazon when we went looking, but many more are "out there" if you take a look. Please contact us if you know of an especially useful resource that is still available to the general public.